3. There is crap all over the sideboard... yet this is what I consider a good crap day. You should see it on an ordinary crap day. 5. I just went on a run. It was embarrassingly brief. Ever go on a run and walk for a while just to take up a few extra minutes, so that your neighbours don't see you returning to your property after only 7 minutes? Beet-faced and sweaty? Panting like a buffalo? While they sit in their lounge and peer out the windows with their stopwatches??? No?? Guys, you're making me feel like this is not normal or something. 6. Oh maaan. Decisions. I hate them. Choosing what to wear is bad enough. But business decisions? Ugh. I think I overwhelm myself at least 3 times a day. MAKE A PLAN AMY. MAKE A FLAWLESS PLAN THAT WILL ALLOW YOU TO BE REALLY REALLY REALLY SUCCESSFUL AND GOOD-LOOKING. Just kidding about the good-looking part. That's what my 7-minute runs are for. 7. Pity running can't do anything for my hair or nose. 8. This post has got out of hand. It's VERY unprofessional. This is the kind of thing that makes me stressed about business decisions. Suppose I launch a very professional design company. Suppose it needs a blog to go alongside it. Suppose I can't change my writing style and keep talking like this. Suppose the company looses all credibility and no-one takes it seriously. Suppose my wealthy middle-aged clients look down on me. Or worse, suppose I DON'T have a blog and the whole business endeavour bores myself to tears, and then I just throw in the towel and have babies. No. They are, like, so easy. It wouldn't be hard at all. I wouldn't be sleep deprived. In all seriousness...... this IS all serious. P.S You may have noticed on Instagram and Twitter I have changed my name to BIRD Interiors. It's still me, promise. And I will reveal more about that in the near future. First I have some decisions to make. More info soon. 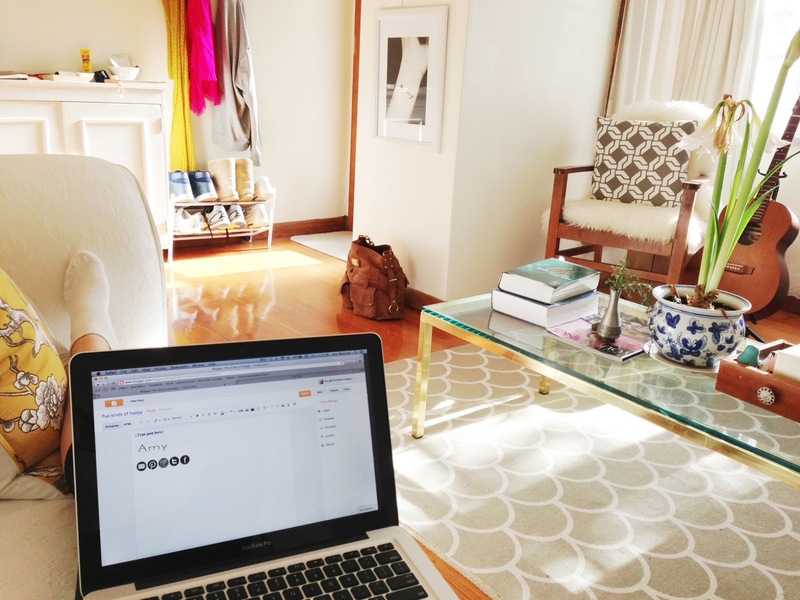 P.P.S More 'making your house work for you' posts are on their way too! 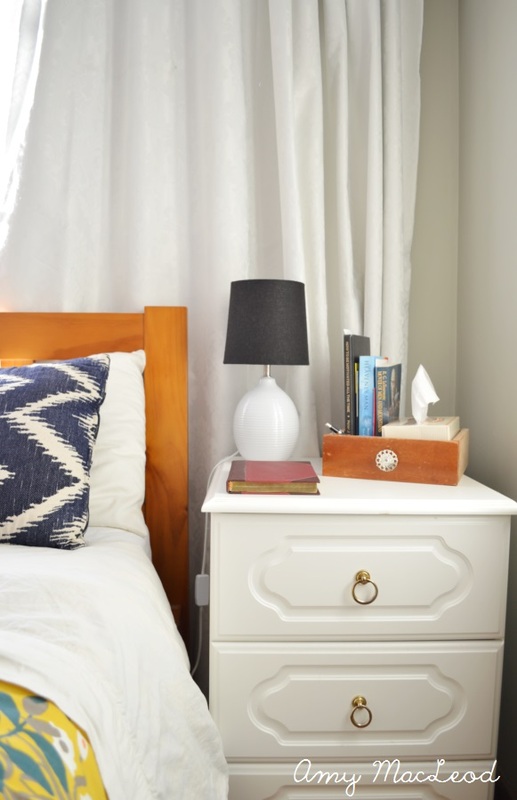 I believe in making your space WORK for you (as I've said before) and here is part 2 for getting your bedside area to work harder, keep itself neater, and just generally be more pleasant to be around. Last time I showed you the trick used to keep the husband's bedside table in order (books, bottles, pens, papers... everything!) and this time it's my side. I have TWO tricks up my sleeve for ya. I don't keep many books here (I feel guilty when I read anything for fun!) but I do need a few key things. 2. Meds, moisturiser, and lipbalm. A bowl for small, practical items. I have pills and things in here which I need to be able to see, but they are messy when loose, so a bowl of course is an easy, practical solution to keep them in one place. But the REAL life saver in this area............??? This SIMPLE fix for a phone charger chord. I got SOOO tired of groping around on the floor for this chord every night when charging my phone, stepping on it during the day, and then trying to kick the ugly chords out of sight (which meant kicking it under the bed... making it harder to get at night). Chords are annoying. I don't need to tell you that. But you know what's not annoying? Using a humble peg to keep it right here, all the time. It's easy on the eyes and oh so practical. What are your tips for this kind of problem? Oh, I love to be perfect. But I'm not perfect. Although I do tend to expect myself to be. Sometimes you can leave the dishes til tomorrow, and give yourself permission to not beat yourself up about it. Sometimes. My secret favourite pastime is designing architectural plans and building them into a virtual 3D model using the software, AND decorating the interior down to every last detail. 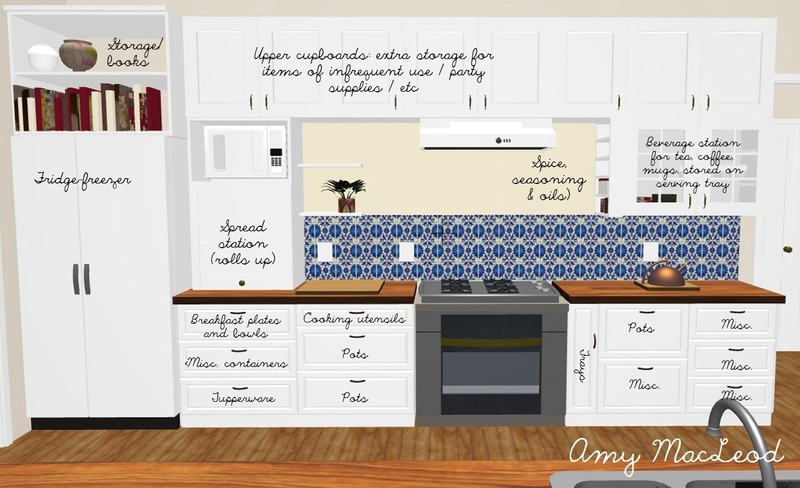 You've seen the design for Dream Office and now here's a little peak into Dream Kitchen. 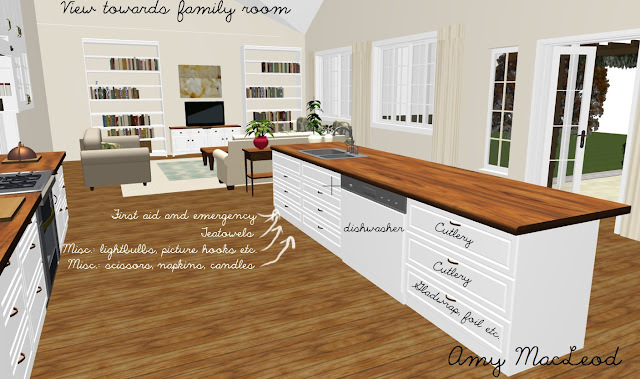 I like to design with a client in mind, and in this case I tried to make the kitchen suited to a farmhouse / entertaining family. They like a warm homely feel, with modern conveniences and a feeling of spaciousness. This is the view of the back wall. To the left of the fridge there is a doorway that leads into the scullery, which houses all the bulky appliances, a second freezer, coffee machine, and recycling bins. I love keeping things organized by having a purpose built spice rack over the stove (for seasonings and oils that you use while cooking). The other view looks out the other way, over the kitchen island, and is open to the family room. The french doors lead to the outdoor eating area, as well as herb garden. What are your must-haves in a kitchen??? 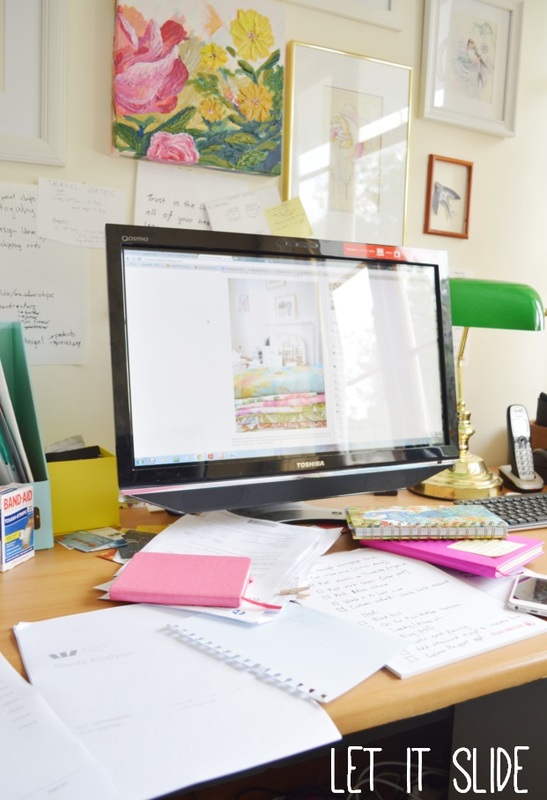 I've said it a zillion times (or at least once here) - I believe in making your home WORK for you. Obviously, making things look pretty is every designer's crack. But you know what's hard? Living somewhere allll the time, and keeping it pretty. Don't know about you but we tend to 'un-style' our spaces on a daily basis... because.... we use our things. 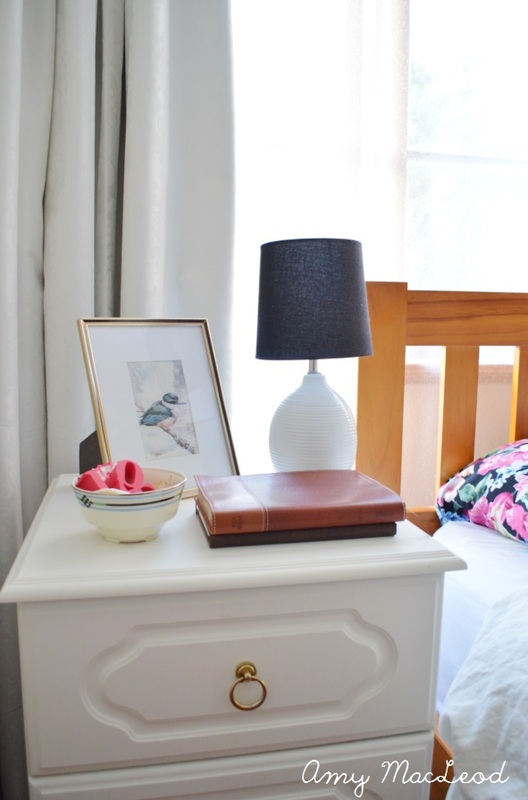 Here's the first part in the 'Making your house work for you' series: Bedside tables. Do you have absolutely zero crap on your bedside table? Do you have space there for fresh bouquets of flowers, glass domes, and small ceramic and brass animals? If you answered no to any of the above then EXCELLENT. Because who does..
- Random items like torches, batteries, keys... whatever. The solution? A vessel for the little bitsies, that can ALSO hold the big bits. In this case, a loose vintage drawer.. (We have 2 and the other was used for a similar purpose on our coffee table). 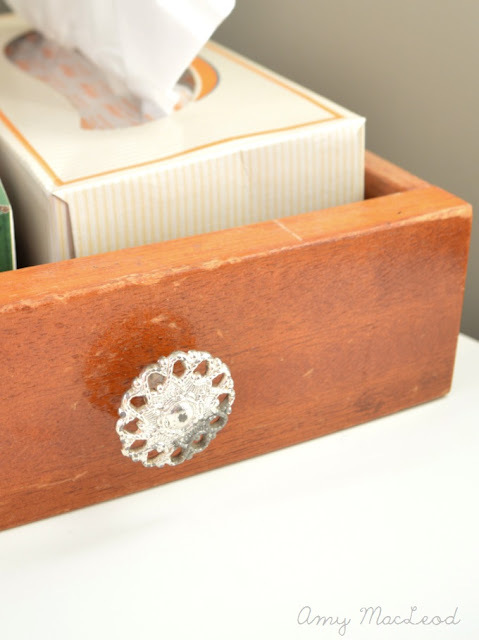 I've found normal trays aren't deep enough to hide anything, whereas this successfully conceals the tissue box, and pens etc floating around inside. It also keeps all the books upright, accessible, and neatly in one place instead of piled up. 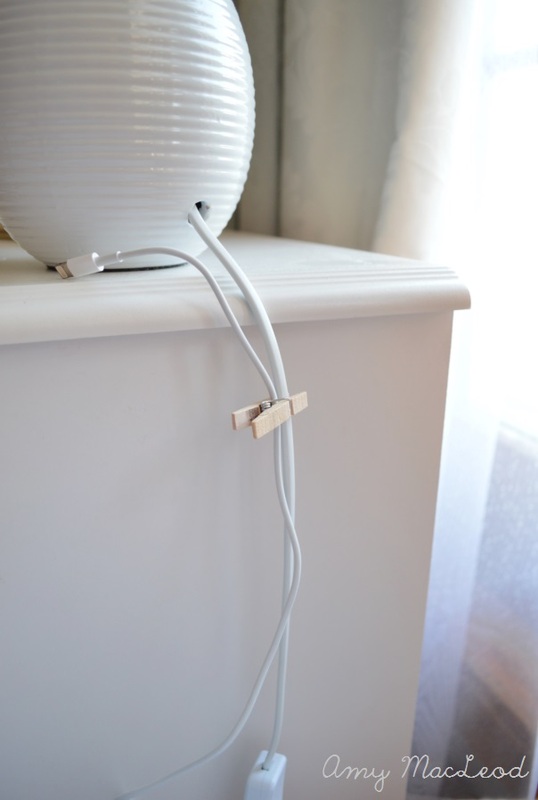 That's part 1 of bedside table solutions - I'll be back next time with 2 more tricks, including for the pesky phone charger chord that's always lurking around these areas! 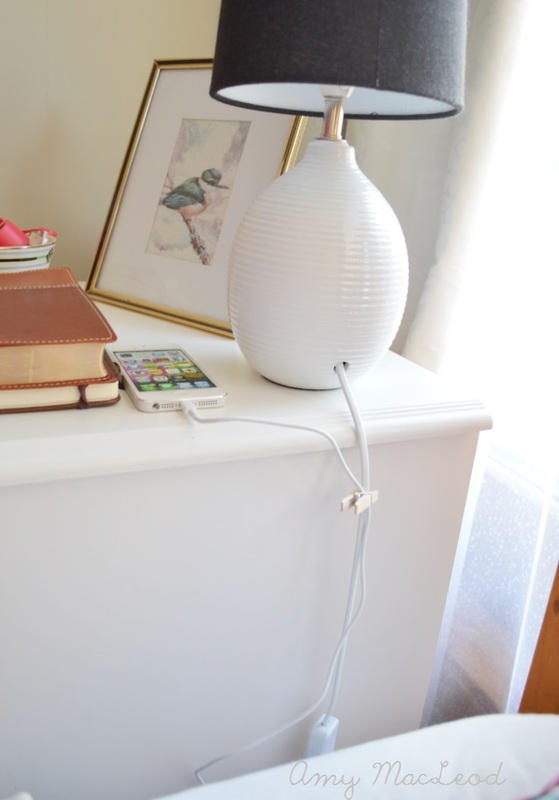 What are your bedside table tricks and tips? Share in the comments! 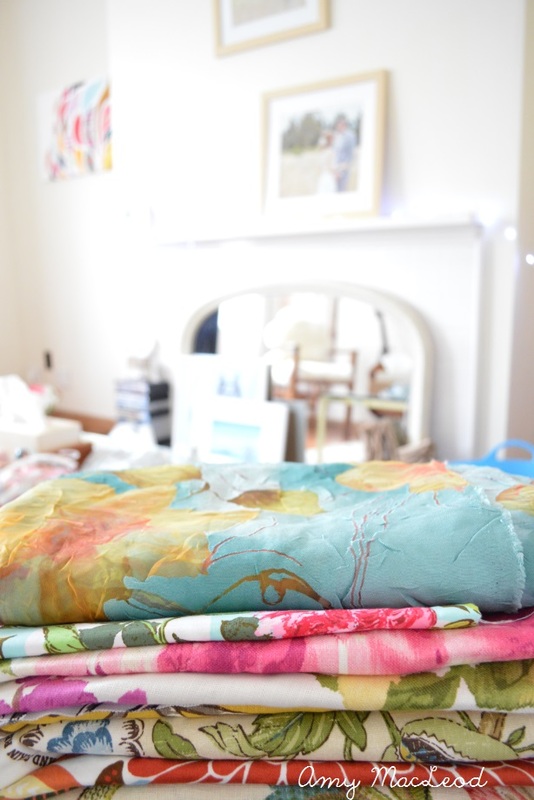 Have you ever bought fabric online only to find it's not quite the way you imagined it? Living in New Zealand, I purchase a lot of my fabrics from overseas. 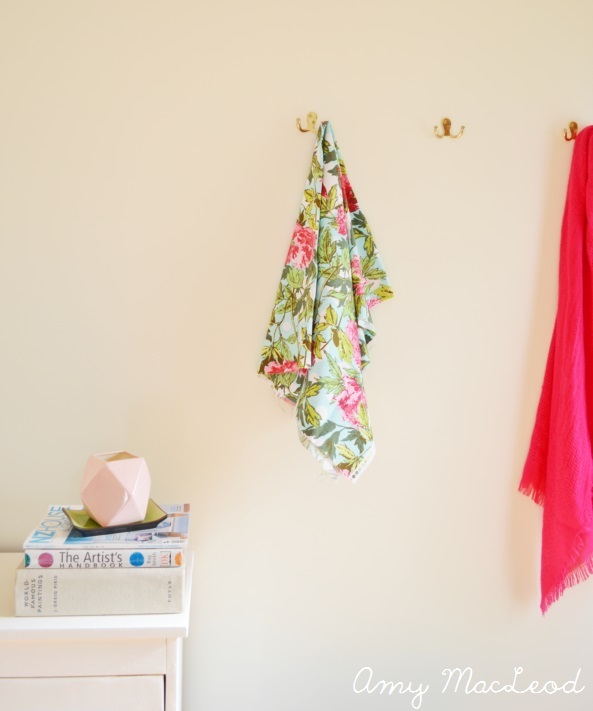 Today I'd love to take you through some of these popular fabrics and let you know how they really are in real life, as well as showing ways you could use them / what colours to pair them with. 1. Dwell Studio Vintage Blossom, in Dove. I adore the Vintage Blossom line - the designs are so classic yet fresh and just perfect for my aesthetic. We have the yellow version in our lounge, and I've never got bored of it. Using this Dove colour, though? Oh, it's trickier than you'd expect!! It's a pale blue with a greyish tone that can easily make your average cream or beige appear really gross and dirty. Our sofa is WHITE but this fabric even made that appear dirty (I guess it's not as clean as I thought). I'd recommend this on PURE white, or even better, against a dark charcoal background., so it pops and appears clear and contrasting. 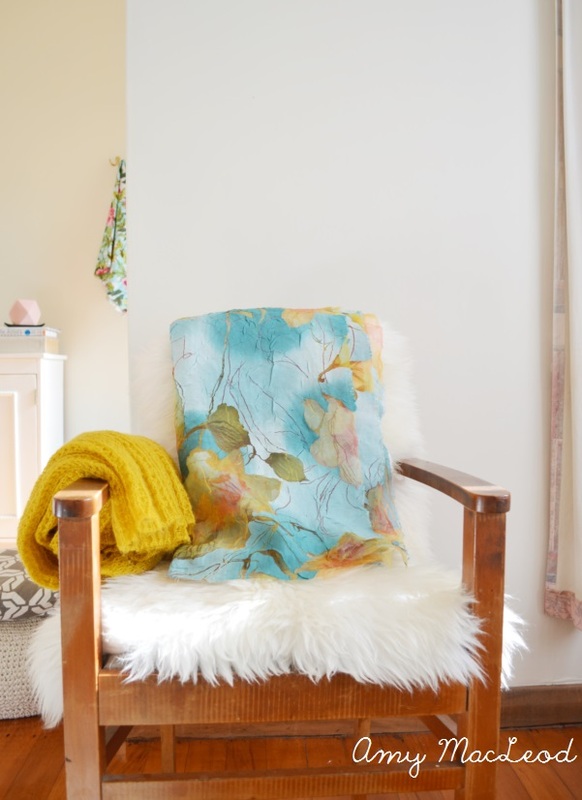 Amy Butler is reknowned for her quirky, bold colour usage and this one is no exception. My problem with it? It is totally COOL in tone so if you want to pair it with warm neutrals or golds, you better think again. 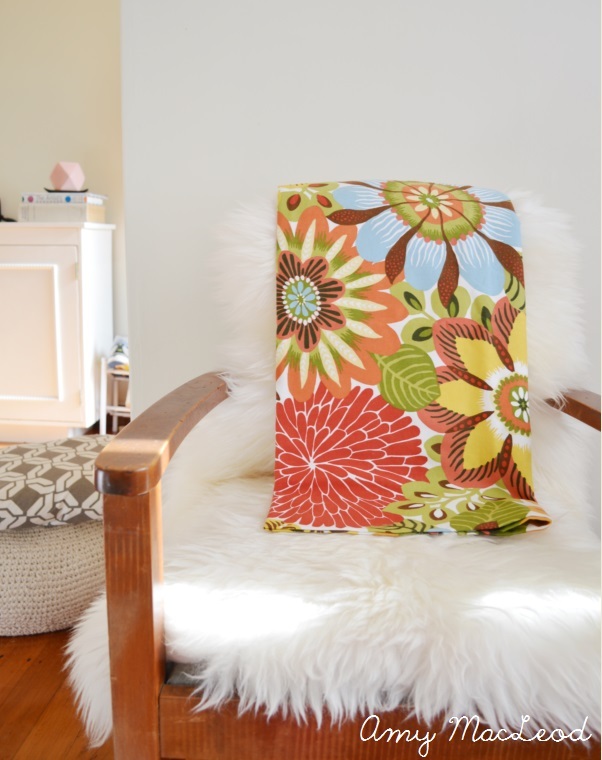 This one would be best in a white or aqua room, alongside some natural wood and accented with pinks or teals. I bought this after seeing it on people's blogs, looking all fresh and poppy, paired with aquas and lemons. You know what? Photos lie! This one is most definitely AUTUMNAL in colour tone and the browns are far more prominent than they appear in photos or online in the fabric shop. Don't be fooled - you must be prepared to have a strong brownish presence in your space if you're going to use this. Aqua, tangerine and gold. I originally purchased this to make a dress from, but here I am years later, still hoarding it as a piece of fabric. It's a crinkly weave that looks exceptionally nice in a rugged homely setting - like here with sheep's wool, a rustic brown chair and gold accents. I'm saving this one for just the right occasion. 5. Rosie Raspberry - P Kaufmann. This is my most recent purchase and I lurve it. My only problem is that I need a space for it! 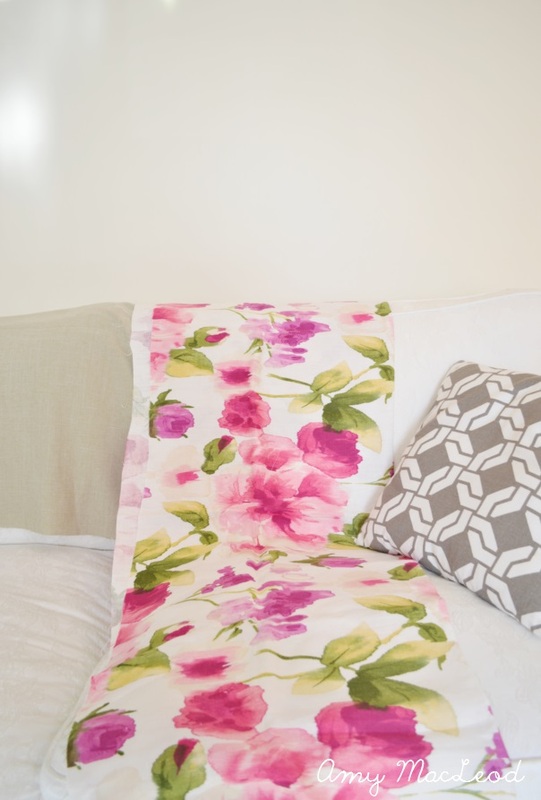 It goes excellently with neutrals and would be a great way to spice up a neutral tan sofa. Who are your favourite fabric brands / designers / suppliers? ?